So you know what I have been doing recently? I have been shelving the physical books I’ve read lately. What a lot of trouble compared to piling them on the floor! I’ve been shifting the contents of those shelves around as necessary to get everything to fit. This is a big and somewhat annoying job, as you might imagine considering I do it only every year or two. Or three. Things I hate: having to decide which books to get rid of. Things I enjoy: taking a close look at my shelves and remembering what’s on them. This time I happened across a book I searched and searched for when I wrote that post about chilling first lines recently. I didn’t remember the author’s name or the book title, and it turns out I didn’t remember the first line accurately either, so you can see why I couldn’t find it when I looked for it. 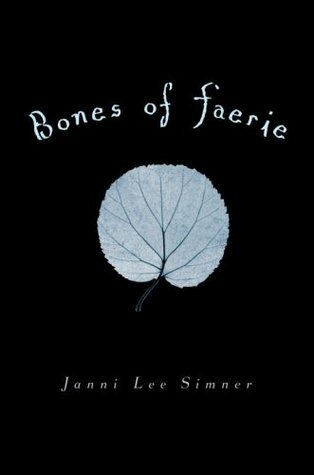 The book is Bones of Faerie by Janni Lee Simner. It came out in 2009, which I think is when I read it. Now, that’s striking. And fairly awful. It certainly sets the tone for the book right away. Dark fantasy, maybe grading into fantasy dystopia – this is probably a fallen world given the mention of “Before.” And so it is – you’ll see how it all works out if you read it. The ending is hopeful, you’ll find, anticipating a brighter world to come, as tends to be the case in YA dystopia. So that’s the one I was trying and trying to think of. Glad I found it. According to Goodreads, there are two other books in the series. Maybe now I’ll pick those up.